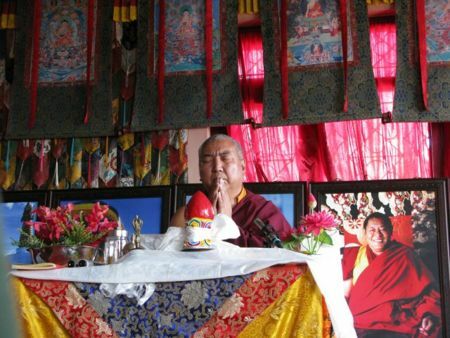 Khenchen Namdrol Rinpoche taught the Rigpa Shedra on Mipham Rinpoche's work on buddha nature (Skt. sugatagarbha): The Lion's Roar: A Commentary on Sugatagarbha. Follow the teachings as podcast at: http://www.rigpawiki.org/Media/Audio/2008-2009/podcast.rss To automatically download all buddha-nature teachings with iTunes, select within iTunes: Advanced/Subscribe to podcast... and paste the podcast-link above. Be sure to select to download all episodes in Settings. Douglas Duckworth, Mipam on Buddha-Nature. The Ground of the Nyingma Tradition, State University of New York Press, 2008. ISBN 978-0-7914-7521-8. The translation is contained in Appendix 1. 1st teaching, 16-Dec-2008: How is buddha nature taught in sutra, tantra and Dzogchen? 2nd teaching, 17-Dec-2008: Our teacher the Buddha has taught on buddha nature emphazising sugatagarbha's essence (Wyl. ngo bo) by teaching on emptiness. On other occasions, he gave clarifications on its nature (Wyl. rang bzhin) by explaining its primordially present qualities. It is crucial to understand that those two aspects are in union. 3rd teaching, 18-Dec-2008: Accuracy of scriptures can be examined by the three types of investigation and understanding establishes irreversible trust by means of the three types of valid cognition. How can buddha nature (tathagatagarbha) be established in this way, as being empty in essence while cognizant in nature? 4th teaching, 19-Dec-2008: A refutation of the position of early Tibetan commentators concerning the interpretation of the meaning of the Uttaratantra Shastra verse. Neither is the fact that the dharmakaya pervades everything sufficient for the existent of the nature (Tib. rigs) nor can suchness be simply understood as mere emptiness in the sense of the approximate ultimate. 5th teaching, 20-Dec-2008: The sugatagarbha is the indivisible union, beyond any possibility of being united or separated, of the primordial purity of the cause and effect of samsara, and untainted appearances which are natural and spontaneous clear light. 6th teaching, 22-Dec-2008: How to establish by reasoning that the sugatagarbha is already present in all beings? 7th teaching, 23-Dec-2008: The nature as the great uncompounded which is unchanging and never separated from it's qualities. 8th teaching, 24-Dec-2008: An answer to objections concerning the presence of the essence of enlightenment in all sentient beings. Why the all-pervasiveness of gotra (rigs) is not refuted by stating that stones have no nature? 9th teaching, 25-Dec-2008: Individual deluded perception does not contradict the authentic viewpoint that all perceptions appear without ever moving from the primordially enlightened state of dharmata. Anwers to objections. 10th teaching, 26-Dec-2008: Each of the three lines relates to one of the first three principles of reasoning thus establishing that all beings have buddha-nature. 11th teaching, 27-Dec-2008: The teachings on sugatagarbha focus on the inseparability of the appearance of kayas and wisdom with their emtpy nature. Both, the teachings of the intermediate turning, which focus more on the emptiness aspect, and the teachings of the final turning, which focus more on the spontaneous presence aspect are therefore definitive teachings and need to be seen in union. 12th teaching, 28-Dec-2008: How the element (khams) abides within the continua of sentient beings. The refutation of some misconceptions concerning the nature of the element. 13th teaching, 30-Dec-2008: A refutation of misconceptions by scripture and by reasoning: the element is neither truly existent, nor an empty void, nor is it impermanent and compounded. 14th teaching, 31-Dec-2008: For those who have not transformed themselves and have dualistic perceptions, there is the incontrovertible and undeniable appearance of inequality. Yet the fundamental nature abides as the great equality in which arising, ceasing, and dualistic phenomena do not exist. 15th teaching, 01-Jan-2009: The benefits and the purpose of studying buddha-nature. The dedication. This concludes Khen Rinpoche Namdrol's teachings on the sengge naro, the Lion's Roar by Mipham Rinpoche. 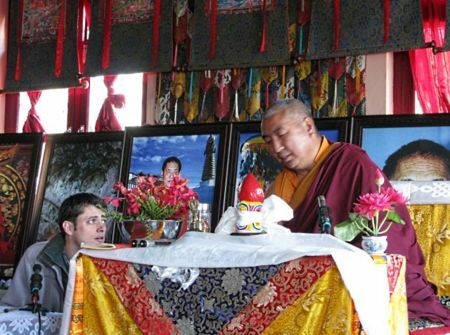 The Rigpa Shedra continues with: Shedra 2009 Teachings on Mipham Rinpoche's commentary on the Uttaratantra Shastra. Visit the Shedra MP3 Library for more online-teachings. ↑ (Wyl. khams), translated as element during the teachings. This page was last edited on 13 July 2010, at 17:08.